Look ahead, eye on apex and exit. Hands on drops, tucked very low for more weight on front wheel and control of front wheel. We rode over to Canada College for our clinic and the backside has a surprisingly nice and short climb and descent. We started with 4 climbs from the bottom, near Canada rd. to the parking lot at the top. The first climb, we climbed mostly seated and stood up once when we were told. On the second climb, we stood up twice when instructed to do so. On the third climb, we went together as a group and this hurt me the most trying to keep up with Dexter and Peter. Finally, for the last climb we went up at our own individual pace. We focused mostly on technique and posture. Some of the advice is obvious, but you hear the advice differently when you have someone shouting at you when you are doing something wrong. Anyone who got caught standing and pedaling with toes pointed downward was deemed a ballerina. We planned on practicing the descents on the Southern most side of Canada College, but because the inside of that turn had loose gravel, we practiced on the same road as the climb. We went over technique, but my main problem was my cornering speed. I have known that my cornering speed is slow and because I am not very fearless, so I will have to slowly work up my confidence and comfort to increase my speed through corners. We ran through the corner about 16 or so times. After the clinic, we rode as a group back to HWY92 and from there, I did a solo aerobic ride to SF to meet up with Nyanko for lunch. My route was tracked by Mr. Garmin. Since we were in the area, we headed over the Mission to grab lunch. For some reason, I thought Ike’s Sandwiches were in the Mission, but they obviously weren’t (ok ok, it isn’t that far from the Mission, but we had a really good meter free parking spot on Valencia!) so we ate at Dosa instead. We have walked past Dosa more than a few times, both on Fillmore and also on Valencia, so today we decided to give it a try. 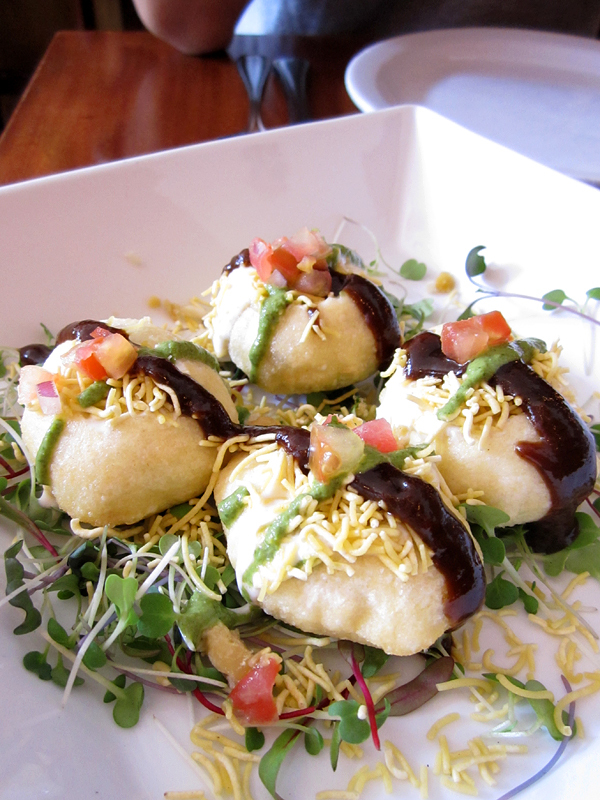 We assumed their dosa and uttapam would be different from the traditional type (not that we really know anything about traditional Indian food), so we ordered a chaat, dosa, and uttapam. Honestly, I had no idea what this would be like, but key words that made me order this were small, crispy, potatoes, and puri. Yes Puri, which apparently is not pronounced “pu ri” like Japanese, but “purr ee”, like an American trying to read furigana. That was how the waitress pronounced it, but she could be wrong! When they arrived, we were told the best way to eat them was with your bare hands because, as I soon found out, they sort of crumble and implode into themselves. They were very hollowed little pastries that were filled with all sorts of yogurt, potatoe, and chutney flavor. I liked the idea and the pastry, but I thought there was a bit too much filling, and a bit too many flavors. More potato could have helped too. 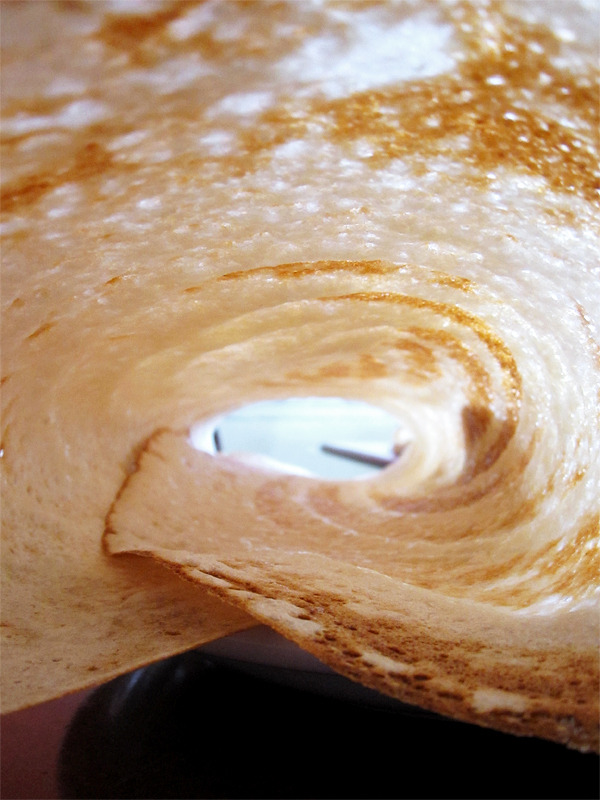 I really liked their dosa. As advertised, it was very thin and crispy and came in one long rolled sheet. The potato filling was on the side and tasted fairly standard, but the dosa tasted great with the coconut chutney and sambar. 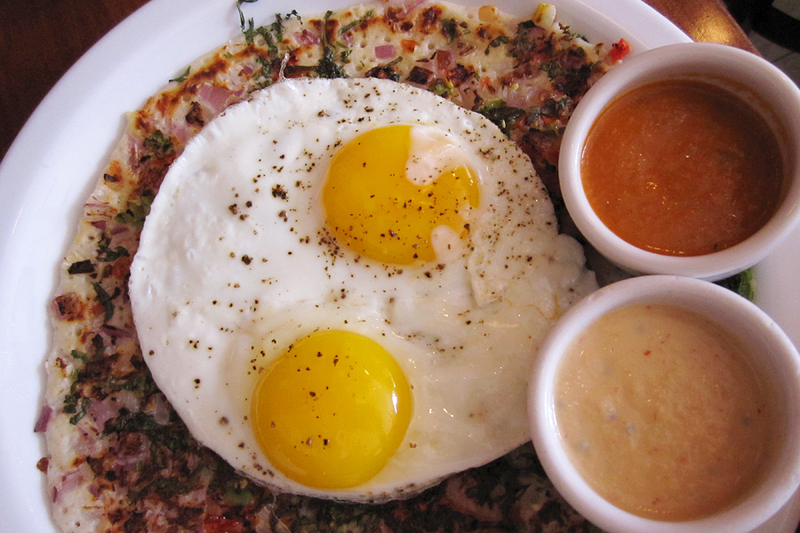 The uttapam that we have had in the past was more like a stuffed thicker dosa, but this one had a texture similar to an chinese potato pancake. Although in general it was good, the spiciness was not mixed out well and some pieces were much spicier than others, so much so that it overwhelmed some flavors. It did however go nice with the egg. 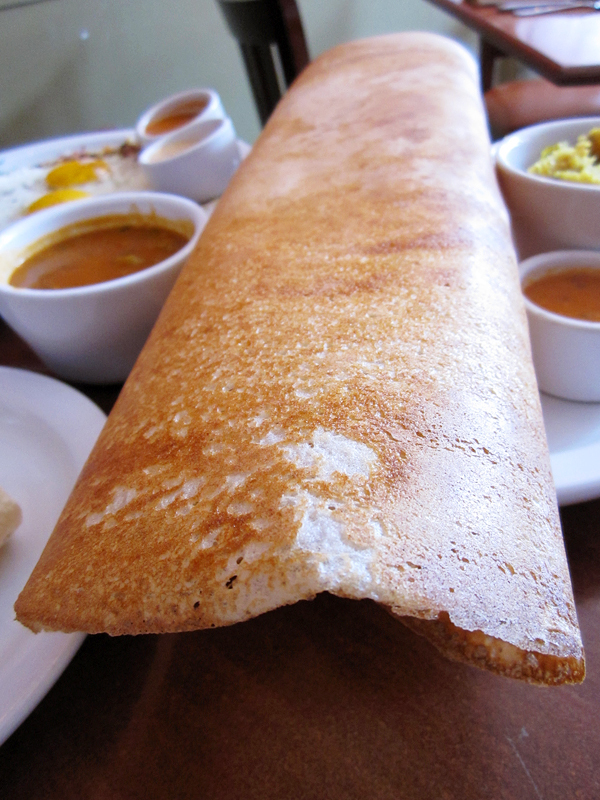 Conclusion: Dosa is very flavorful, but it is a bit on the spicy and pricey side. This season, I have been looking for a local cycling team to join that would develop my fitness and racing. I inquired with Peninsula Velo, Roaring Mouse, and Third Pillar. Weighing my options, I decided to go with Pen Velo. Additionally, I joined their Performance Team to get in on some coaching and skill clinics. This Saturday, I met some members of the team for a time trial clinic. We started off practicing starts with both feet clipped in (with a person holding your bike). The first try, I started in too high of a gear and found it hard to accelerate. The next round, we rode a 5 mile ITT on Canada Road from 92 to Pulgas Water Temple and back. After being thoroughly wasted, from the wind and the hill, we then split up into groups and rode a 4 man TTT along the same route. The pace was fast, but not uncomfortable. For the first half of the course, we did 30 second pulls. and after the turn around point, we pulled harder 20 second pulls. When we got within 25% to the finish, we did very hard 10 second pulls. Since we were simulating a 4 man TTT, where the third rider’s time is counted, I dropped off before the finish after taking my final pull. So after we did two TT’s, where we yelled at told to go essentially 100%, we did a 30 mile ride along the normal PV route. We had a mellow double paceline going until we got to Alpine, where our group dropped to six and the speed went up considerably. Coach Clark, made sure I was ok staying with them and I did… barely. I nearly got dropped going up Aratradero Rd, but I was able to hang on all the way back to HWY92… and even contribute to the paceline. Overall, it was a good first meeting with the team. I thought the clinic was good, and the coach was knowledgeable, and the other PV members were friendly. I got in a nice long ride too, but maybe it was a bit too much mileage the day before a race.